This is a .58 caliber bullet (Minie ball) that was dropped on the battlefield, route of march or campsite. 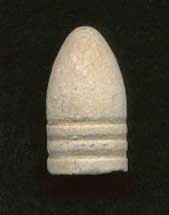 It was the most commonly used bullet during the Civil War, being used by both Confederate and Union troops. This would be great for display or an inexpensive gift to spark someones interest in Civil War history. I have several of these so the one pictured may not be the exact one that you receive. All are comparable to the one pictured. This is a dropped .58 caliber Gardener bullet. It was only used by Confederate troops. It was made in the Confederacy and only during the Civil War. 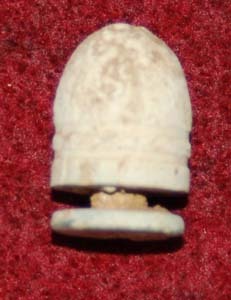 It is a two part bullet with a pressed base. If you look at it, it gives the impression of a bullet inside of a bullet (if that makes sense). This particular round was made for the new musket. It has a small hole in it which appears to be a casting flaw. Either that or a soldier took a chunk of the lead out. Anyway, if you want a representation of the Confederacy during the Civil War and do not want to spend half of your paycheck, this is the item for you. This is a .58 caliber bullet or Minie ball as so commonly referred to. 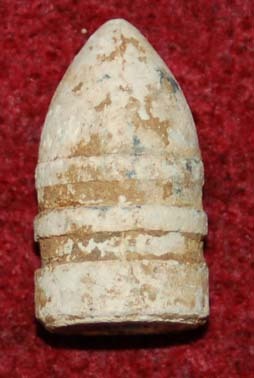 This one has been removed from the barrel of the soldiers rifle by means of a puller screwing into the tip of the lead bullet. Once this was accomplished, the soldier could just pull the bullet out at the end of a patrol or picket duty. These are not as common as the drops, but they are out there. Get a piece of history that until now, had not been touched by human hands for at least 139 years. A great and inexpensive gift for someone interested in history. 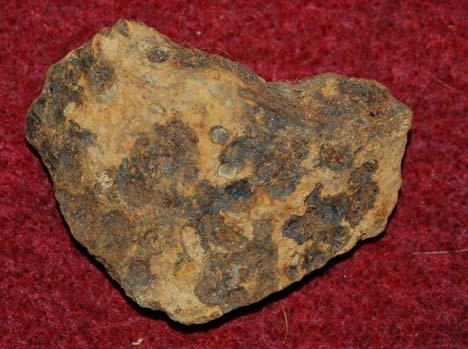 This is a shell fragment from a Hotchkiss shell, which was fired during the battle of South Mountain, MD. The battle took place on Septembet 14, 1862. General Robert E. Lee lead the Army of Northern Virginia North of the Potomac River in an attempt to take the fight to the enemy, the Army of the Potomac which was lead by General George B. McClellan. General Lee had divided his army into five parts prior to the battle to achieve various goals. Approximately 13,000 Confederates and 36,000 Federals were involved in this battle. At the end of the days fighting, General Lee withdrew his troops toward Antietam Creek or Sharpsburg, MD. Of interest: future presidents Rutherford B. Hayes and William McKinley were involved in this action. Lieutenant Colonel Hayes was wounded fairly seriously during the fighting. This battle took place just three days before the battle of Antietam (the bloodiest day in American history). This fragment was recovered from private property with permission given by the owner. It measures approximately 1 3/4 inches by 2 1/2 inches. 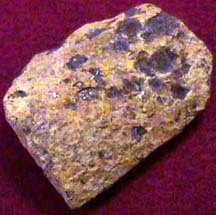 The surface of the fragment is covered with rust, but can be removed and treated if you chose to do so. This will further preserve the fragment. Get a small, but affordable piece of American History. 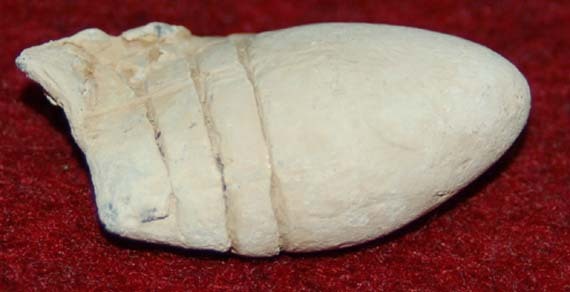 If you were to buy a whole inert shell, it would cost in the neighborhood of $300.00. U. S. Shipping- Insured Priority Mail on this item would be $6.25. First Class shipping is also available. Email me for a quote. If ordering multiple items, the total weight and value of the combined items in the package will determine the postage. This is a fired .58 Caliber bullet. It is also referred to as a three ringer of more commonly as a Minie ball. 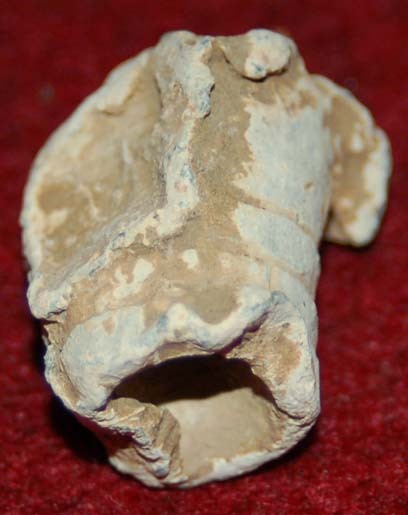 The soft lead has been disfigured from striking a solid object, but you can still see signs of the three rings at the base. This was recovered from private property in Virginia with the owners permission. This is a fired .58 Caliber bullet. It is also referred to as a three ringer of more commonly as a Minie ball. 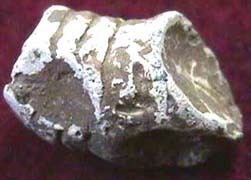 The soft lead has been disfigured from striking a solid object, but you can still see signs of the three rings at the base. This was recovered from private property in Virginia with the owners permission. This one even contains some Northern Virginia red clay, which I will include free of charge. This is a Type III Williams Cleaner Round with the zinc base still attached. Many times these will be found missing the base. These rounds were issued with the standadard .58 caliber rounds in an effort to keep the barrel on the musket clean. Each bullet may have dried dirt, knicks and pits. Afterall...they did come out of the ground after being dropped at least 142 years ago. U.S. Shipping- $2.00 First Class Insured or $6.25 Priority Mail Insured. If you order several items the shipping can be combined to save you money. Email me for a quote. 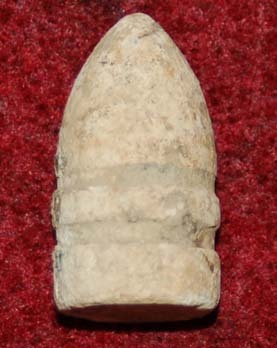 This is a nice example of a Sharps Carbine bullet. The Sharps Carbine was unique, as it let the shooter load from the breech, thus increasing the rate of fire that could be put down range. This is a .54 caliber bullet and was used almost exclusively by U. S. troops. These were not as common as the .58 caliber three ringer. Each bullet may have dried dirt, knicks and pits. Afterall...they did come out of the ground after being dropped at least 142 years ago. This is a nice example of a Sharps Carbine bullet. The Sharps Carbine was unique, as it let the shooter load from the breech, thus increasing the rate of fire that could be put down range. This is a .54 caliber bullet and was used almost exclusively by U. S. troops. Each bullet may have dried dirt, knicks and pits. Afterall...they did come out of the ground after being dropped at least 142 years ago. 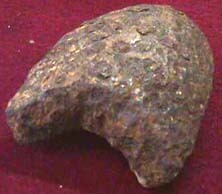 This is a shell fragment from a Hotchkiss shell, which was fired during the battle of South Mountain, MD. The battle took place on Septembet 14, 1862. General Robert E. Lee lead the Army of Northern Virginia North of the Potomac River in an attempt to take the fight to the enemy, the Army of the Potomac which was lead by General George B. McClellan. General Lee had divided his army into five parts prior to the battle to achieve various goals. Approximately 13,000 Confederates and 36,000 Federals were involved in this battle. At the end of the days fighting, General Lee withdrew his troops toward Antietam Creek or Sharpsburg, MD. Of interest: future presidents Rutherford B. Hayes and William McKinley were involved in this action. Lieutenant Colonel Hayes was wounded fairly seriously during the fighting. This battle took place just three days before the battle of Antietam (the bloodiest day in American history). This fragment was recovered from private property with permission given by the owner. It measures approximately 1 1/4 inches by 2 inches. 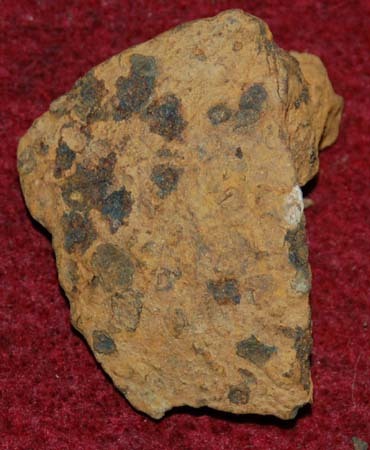 The surface of the fragment is covered with rust, but can be removed and treated if you chose to do so. This will further preserve the fragment. Get a small, but affordable piece of American History. If you were to buy a whole inert shell, it would cost in the neighborhood of $300.00. 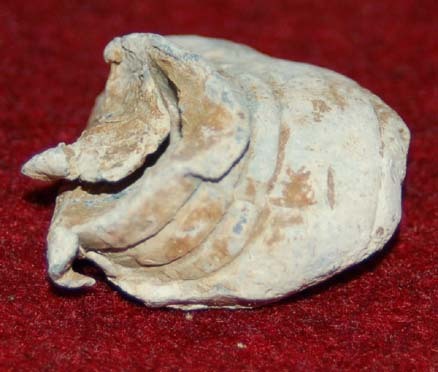 Shell Fragment from Battle of South Mountain, MD This is a shell fragment from a Hotchkiss shell, which was fired during the battle of South Mountain, MD. The battle took place on Septembet 14, 1862. General Robert E. Lee lead the Army of Northern Virginia North of the Potomac River in an attempt to take the fight to the enemy, the Army of the Potomac which was lead by General George B. McClellan. General Lee had divided his army into five parts prior to the battle to achieve various goals. Approximately 13,000 Confederates and 36,000 Federals were involved in this battle. At the end of the days fighting, General Lee withdrew his troops toward Antietam Creek or Sharpsburg, MD. Of interest: future presidents Rutherford B. Hayes and William McKinley were involved in this action. Lieutenant Colonel Hayes was wounded fairly seriously during the fighting. This battle took place just three days before the battle of Antietam (the bloodiest day in American history). 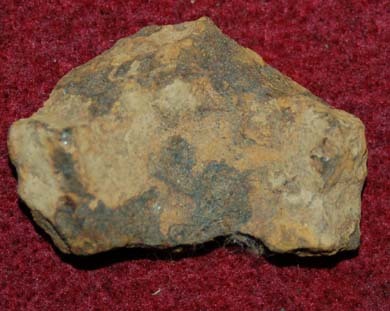 This fragment was recovered from private 1 1/4 inches by 2 inches. 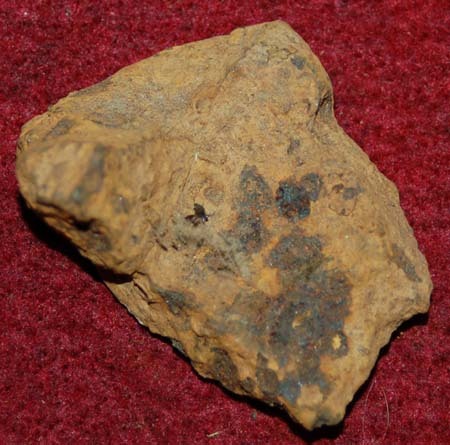 The surface of the fragment is covered with rust, but can be removed and treated if you chose to do so. This will further preserve the fragment. Get a small, but affordable piece of American History. If you were to buy a whole inert shell, it would cost in the neighborhood of $300.00.